It was my first day at my new job as a kennel attendant with a local dog rescue in the spring of 2007. The kennel manager was walking me through the property explaining the daily routines and duties. As we made our way through the kennel, 25 dogs began to noisily bark, jump and whine when they realized a stranger had entered their haven. Having volunteered at an animal shelter previously, I was used to the ear-piercing cries for attention and unrest as echoes of dogs jumping off of metal doors reverberated through the kennel. We approached a particular kennel when the manager turned to me warning me that I was to be “very careful” and to “go slow” with this dog. I cautiously peered into the dog’s kennel, and the next thing I knew, a gold and brown striped American Staffordshire Terrier dog, named Annie, was baring her teeth at me and jumping with all of her energy at the kennel door threatening me to take one step closer if I dared. With my eyes wide and heart beating fast, I quickly stepped away and continued walking, wondering if I was in over my head with this job. After all, as a volunteer I had only ever handled the dogs who were labeled tame and friendly enough that even a brand new volunteer with no dog handling experience was able to walk them. Now that I was an employee of a dog rescue, it was my duty to ensure every dog was fed, cleaned and properly cared for, no matter the temperament. I learned Annie had been living in an abusive situation prior to her rescue. Because of her past, she had issues trusting new people, as she had been let down by the one person who she needed to trust the most. One day, a month or so into the job, after feeding Annie, I noticed that when I began to walk away from her after sliding her food bowl to her, she didn’t attempt to snap at me or bark or even lunge. Instead, she looked at me, pulled her ears back and lowered her head and began wiggling the entire backside of her body. I knew then a change had occurred; Annie was finally used to me and was ready to trust me. The kennel manager decided it would be a good time to take a walk with Annie, and the three of us strolled down the walkway. About half way down, the kennel manager nonchalantly handed Annie’s leash over to me, and before I knew it, I was actually taking Annie for a walk! From then on, Annie and I couldn’t be separated. I took her out almost every day for a walk, and eventually I took a chance with her off leash at the rescue’s dog park. That’s when I discovered just how much she loved to play ball! Not just chase it down the hill, but she would set the ball on the ground, lay upside down on top of the ball and with the ball underneath her would wiggle her whole body down the hill until she reached the bottom all with a giant grin on her face. I had never seen her happier. Annie and I became so bonded that when she would see me she’d excitedly whine and whimper and jump all over me when I came to put the leash on her. The feeling was definitely mutual. I regularly bathed and groomed Annie, and after a while, this formerly “staff only” dog was going on walks with experienced volunteers, riding around with the staff on the property golf cart and spending time in the office with the managers. Annie had really opened up to strangers and would look forward to her walks. The kennel manager decided it was time to work on finding Annie a home. This wasn’t an easy task, unfortunately. 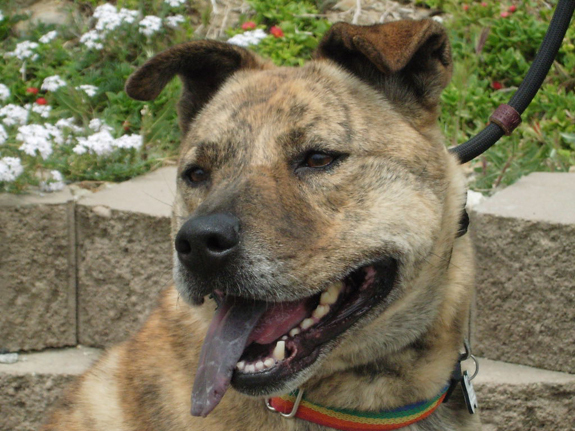 Not only was Annie a pit bull mix, one of thousands in the LA county shelter system, but she was also considered a senior in the rescue world being that she was 7 years old at the time. 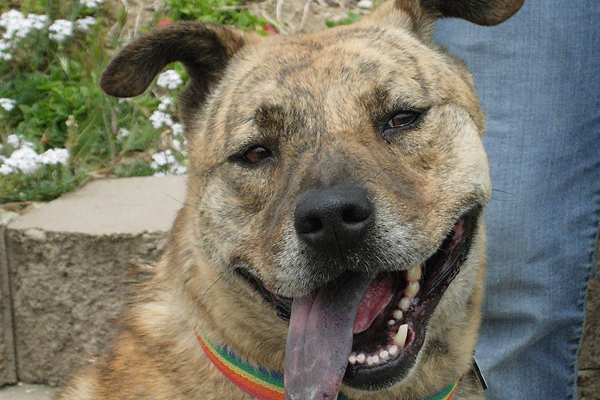 With so many pit mixes in need of homes and so many more under the age of 5 years old, the chance of this particular senior pit mix finding a home was slim. 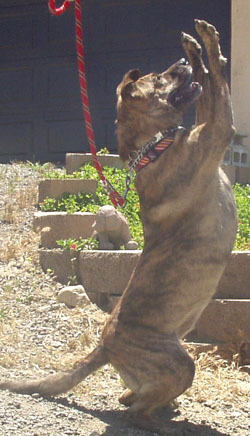 Combine that with her brindle “tiger-like” coat, viewed by some as “scary,” and you had a recipe for a hard-to-place dog, as they’re known to rescues. That didn’t stop us from trying, though! I knew pit bull mixes were one of the highest breeds of dogs to be euthanized and end up in shelters, but it wasn’t until Annie that I really understood how widely spread the misconception of pit bulls really was. This was more than a case of over-population; this was discrimination on an animal’s level. Annie had already been waiting at the rescue for her new home for a year before I arrived. I began to wonder if there truly was a home out there for her. A year and a half later, a close friend was introduced to Annie. His initial reaction to Annie’s lunging and barking was about the same as mine had been on my first day of work. He wasn’t as convinced as we were that he was the right home for Annie, but after visiting Annie several times to get to know her and taking her on hikes, playing ball and spending his spare time with her, Annie came to love him just as much as she did us. Annie was finally ready to go home. The day Annie was adopted was both the happiest and saddest day of my employment. When her adopter drove up to take her home, I cried instantly. I couldn’t imagine not seeing Annie every day and sharing our time together at the dog park. It turns out, this “stranger aggressive” dog was so happy and relaxed in her new home, she would let just about anyone come into the house. Of course there was always the initial uncertainty and barking as any dog displays when new people arrive, but all it took was a pat on the head and “Hi, Annie!” and she was your best friend. That’s so neat! It’s so great that you hung in there after that first experience you had with Annie and gave her a chance to show you her true self. Matt.S It’s wonderful, isn’t it?